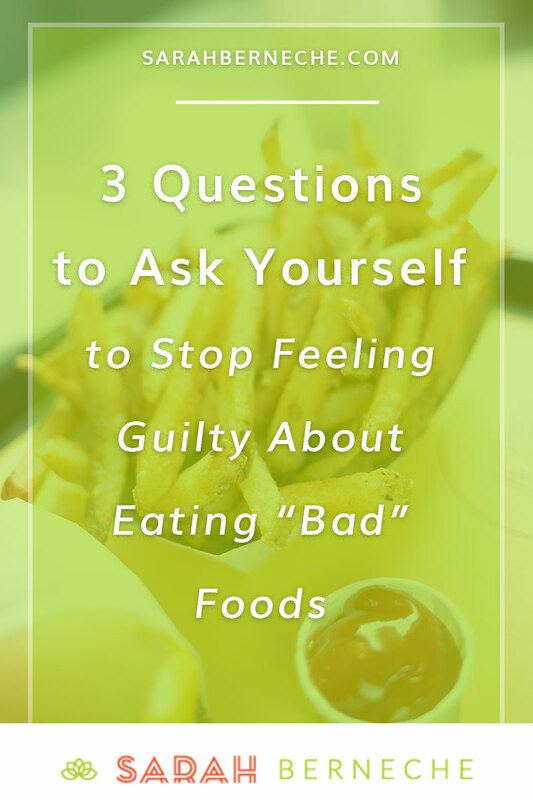 Whether you’re new to intuitive eating, deeper into learning about the non-diet approach, or at a different stage of your eating disorder recovery, it’s very possible you still feel guilt or shame about — or judge — the foods you’re eating. This can feel especially irritating if you’ve embraced body positivity and intellectually know restriction — or holding on to the diet mentality — isn’t serving you. Guilt and shame around “forbidden” foods is one of the most common conflicts I address in my nutrition practice. And you know what? It has nothing to do with the food. An apple and potato chips would be morally neutral if it weren’t for diet culture’s interventions. Moving away from restrictive tendencies and toward a more liberated approach to food requires vigilant questioning and criticism of the diet industry and its trappings. Who decides what’s “healthy”? How have I come to my beliefs about food? Why do I feel like eating multiple servings of a “forbidden” food is too much? What’s wrong with enjoying a chocolate bar? Dissolving judgment, guilt, and shame around food takes ample time, and isn’t easy or straightforward, here’s 3 questions to start asking yourself to make peace with food. 1. How do I believe my feelings are benefitting me? When we speak about judgment, guilt, and shame about food, chances are good we’re talking about judgment, guilt, and shame about body. If you’re unsure if this is true, ask yourself this: If I totally loved my body and how it gets received in the world, would I care about the double cheese pizza I’m eating right now? If you are still trying to manipulate your body size or shape in some form or another — even in subtle ways — they can lead to feelings of guilt and shame around food. While food exposure therapy can be helpful at normalizing “forbidden” foods, deeper body image work and fat acceptance are necessary for completely neutralizing the charge. Fully recovering from diet culture and disordered eating requires complete acceptance of your natural body. 2. What’s consistent about the foods I carry negative feelings for? We can get so caught up in the diet mentality bubble that we often miss its trappings. It’s important to question — and keep questioning — your beliefs and reactions about food. What’s similar about the foods you’re reacting to? Are you always eating these “forbidden foods” at the same time? In the same way? It’s helpful to look at your food and eating patterns. Are there certain food groups that provoke a deeper reaction from you than others? Do you feel safe around fat, but not around sugar? What sorts of messages are you exposed to on a regular basis? Which foods are demonized at your office? In the room? Within your friend groups? Food exposure therapy doesn’t just happen at the table. It happens out in the world. 3. What do I think about when I’m eating these foods? Do donuts remind you of anyone or anything? What about French fries? In the same way that certain foods carry positive connotations — enjoying fresh-picked raspberries with your grandmother, for example, or savouring an ice cream cone with your best friend on a hot summer’s day — we also carry more negative food experiences with us (I’m looking at you, negativity bias). Are those negative moments making it tough to neutralize certain foods? It’s important to look at the framework around the foods you feel guilt or shame toward. In my professional experience, the medium can be as important as the message. Now, I want to know: which of the three questions above do you find the most helpful? Does one resonate more than the others?